First of all, daughter Lovina will be 14 tomorrow, May 18. A happy birthday to her! Also, happy 25th birthday today, May 17, to my niece Elizabeth. We are invited to her parents (sister Liz and husband Levi) on Saturday for a surprise birthday party for Elizabeth. With so much gardening and spring work it doesn’t look like we will make it. Elizabeth is married to Samuel and has two little children LaRose and Samuel Lee. I want to add a paragraph that was omitted from my last column. While visiting family we also stopped in to visit with sister Liz and Levi. Their daughter Rosa and her husband Menno have living quarters in the new building beside the house. They have a little boy named Jeremiah. Daughter Susan and baby Jennifer were with us. Susan and Rosa hadn’t seen each other’s babies yet. Always nice to catch up on the little ones. They grow so fast and are so precious! Daughter Loretta and special friend Dustin enjoyed the wedding in Andover, Ohio, last week. They (Dustin’s family and Loretta) traveled up to Niagara Falls and enjoyed seeing the beautiful sights. It was Loretta’s first time to see New York (even before I did—smile). They had a nice time and arrived safely back in Michigan on Friday evening. 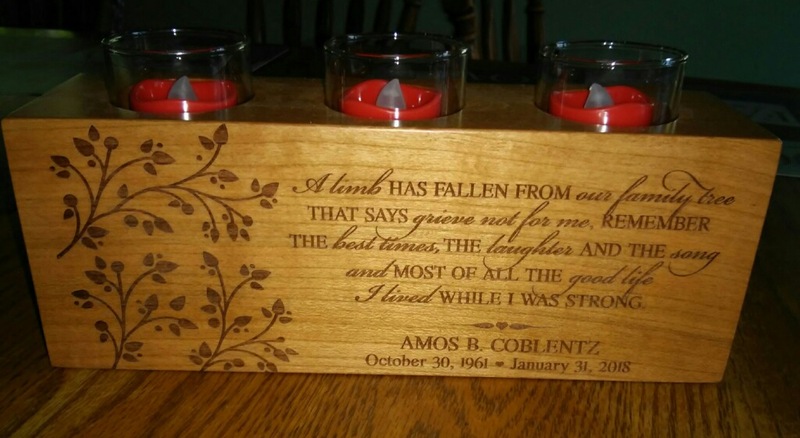 Verena gave this beautiful candle/plaque to Lovina for Mother’s Day, in memory of Lovina’s brother, Amos Coblentz. Sunday was Mother’s Day. So I hope all mothers had a nice day, spending it with family! 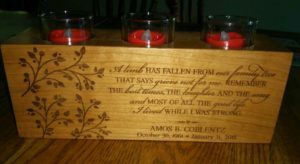 My mother passed away in 2002 unexpectedly. I still miss her so much. I have many precious memories of her. I started penning this column in 2002 after her sudden passing. She wrote it for eleven years. Rest in peace dear mother—you will always stay close in our hearts. The good example she left makes me want to always try and do my best! My children all came home for a brunch on Mother’s Day. We had bacon, ham (fresh ham on the grill), eggs, potatoes, sausage gravy, toast, jelly, butter, coffee, milk, and juice. Also rhubarb custard pie and peanut butter swirl bars. Spending time with family is always precious to me. Timothy and Elizabeth left early afternoon as his brother’s family was coming to their house for supper. Mose and Susan were here for an early supper of fried chicken. Yesterday, daughters Elizabeth and Susan came here for the day. Usually every Wednesday they come home for the day. Daughter Verena, 20, started working for nephew Emanul several weeks ago. She works in the office doing a lot of secretarial work for his woodworking business. She works four days a week and has Wednesdays off. She is glad to be home on the day her little nieces are here to entertain. Yesterday was such a nice day we decided to head to town. We took three buggies and horses. Elizabeth, Susan, and baby Jennifer went with Elizabeth’s buggy and horse. Verena, Abigail, and I went with our buggy and our horse, Mighty. Loretta, Joseph, and Lovina followed with our other buggy and our horse Midnight. We did some shopping and decided to eat at a family restaurant. Little Abigail had so much fun. Daughter Lovina was glad for a break from her school work. After we were back home Joseph, 15, mowed our yard. The girls took Abigail down to the nearby lake and let her walk in the water. She didn’t want to leave. Around 5:00 p.m. Elizabeth and Susan headed for home. The girls made an easy supper of BLT sandwiches and we also had leftover tater tot casserole from the evening before. It was an enjoyable day! Nephew Henry is home today and also was yesterday. He hurt his foot at work and it is really swollen and painful. He went to the doctor yesterday and they took an x-ray at the hospital. He should find out the results today. I hope it is not broken. He is using a pair of crutches we had and is keeping ice packs on it. It looks like we are going to have another beautiful day! Laundry and planting more garden is on the list for today. God bless all of you! I will share this recipe for baked French toast. We make this a lot. Its easy and you can put it in the oven. We love maple syrup on ours. Bring brown sugar, butter, and corn syrup just to a boil and then pour into the bottom of a 9×13-inch glass pan. Top with two layers of bread. Mix the sugar and cinnamon together and sprinkle on top of the bread. Then beat together eggs, milk, and vanilla and pour over the bread. Bake at 350 degrees for 30 to 35 minutes. Do not overbake or syrup on the bottom will get hard.